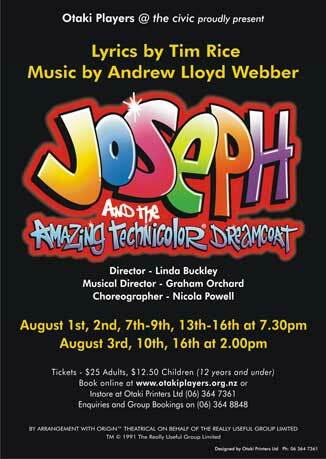 Otaki Players continue to surprise and delight with spectacular productions and the musical Joseph and the Amazing Technicolour Dreamcoat provides another thrilling experience for theatre goers of all ages. Lyrics are by Tim Rice and music by Andrew Lloyd Webber who together comprise a team that never fails to deliver the most stunning musical experiences, combining sensational music and brilliant words. It is estimated that this musical has been performed internationally in nearly 20,000 schools or local theatres, involving over 700,000 performers of all ages, and with an audience in excess of 9 million people, since its first performance in 1968. Director Linda Buckley, Musical Director Graham Orchard and Choreographer Nicola Powell have a highly successful track record in bringing musical productions to the stage. For this show they have assembled a talented and vibrant cast of 19 children and 40 teenagers and adults who are all geared up and ready to take the stage at the fabulous Civic Theatre. Nancy Carr and Wendy Jones have really pulled out all the stops and come up with stunning costumes. Prepare to be amazed! Very little dialogue is used, the music and lyrics containing the drama and intense emotion of the story. A variety of musical styles are used including ‘rock’n’roll’, country and western, Charleston, calypso and disco. You will be singing along before you know it to these glorious songs! Whatever you do this winter, don’t miss this knockout show. This vibrant and heart-warming production is just what you need to combat the cold!